Nitish Mittal is a member of the IT Services team and assists clients on topics related to Healthcare and Life Sciences (HLS) IT. Nitish’s responsibilities include leading Everest Group’s HLS IT PEAK Matrix evaluations as well as custom engagements on emerging technology themes, sourcing constructs, demand-supply dynamics, and thought leadership initiatives. Just days before 16-year old Qualtrics was due to launch its IPO, SAP announced its acquisition of the customer experience management company in an attempt to bolster its CRM portfolio. Qualtrics, one of the most anticipated tech IPOs of the year, and oversubscribed 13 times due to investor demand, adds to SAP’s arsenal of cloud-based software vendor acquisitions. Seeking transformational opportunities, the acquisition will allow SAP to sit atop the experience economy through the leverage of “X-data” (experience data) and “O-data” (operational data). Moreover, the acquisition will enable SAP to cash in on a rather untapped area that brings together customer, employee, product, and brand feedback to deliver a holistic and seamless customer experience. Second, it sits conveniently within SAP’s overarching strategy to push C/4 HANA, its cloud-based sales and marketing suite. SAP’s acquisition history makes it clear it seeks to achieve transformative growth by bolting in capabilities from the companies it acquires. It has garnered a fine reputation when it comes to onboarding acquired companies and realizing increasing gains out of the existing mutual synergies. Its unrelenting focuses on product portfolio/roadmap alignment, cultural integration, and GTM with acquired companies have been commendable. SAP has taken a debt to finance the Qualtrics acquisition, making it imperative to show business gains from the move. With Qualtrics on board, it seems SAP’s ambitious cloud growth target (€8.2-8.7 billion by 2020) will receive a shot in the arm. However, the acquisition is expected to close by H1 2019, implying that the investors will have to wait to see returns. Moreover, SAP’s stock price in the past 12 months has dropped by 10.6 percent versus the S&P 500 Index rise of 3.4 percent. While SAP has seen revenue growth, its bottom-line results have been disappointing with a contraction in operating margins (cloud revenues have grown but tend to have a lower margin profile in the beginning.) This is likely to be further exacerbated given the enterprise multiple for this deal. Having said that, SAP sits in a solid location to win the war against the age-old enterprise conundrum of integrating back-, middle-, and front-office operations and recognize the operational linkages between the functions. Qualtrics’ experience management platform, known for its predictive modeling capabilities, generating real-time insights, and decentralizing the decision-making process, will certainly augment SAP’s value proposition and messaging for its C/4 HANA sales and marketing cloud. In fact, the mutual synergies between the two companies might put SAP at an equal footing with Salesforce in the CRM space. Delivering more proactive and predictive insights to alleviate experience inadequacy. SAP’s Intelligent Enterprise strategic tenet, enabled by its intelligent cloud suite (S/4 HANA, Fiori), digital platform (SAP HANA, SAP Data Hub, SAP Cloud Platform), and intelligent systems (SAP Leonardo, SAP Analytics Cloud), has allowed customers to embed cutting edge technologies – conversational AI, ML foundation, and cloud platform for blockchain. SAP is already working towards the combination of machine learning and natural language query (NLQ) technology to augment human intelligence, with a vision to drive business agility. Embedding the experience management suite within next-generation Intelligent Enterprise tenet will play a key role in achieving the exponential growth targets by 2020. Please share your thoughts on this acquisition with us at: [email protected] and [email protected]. Last week, General Electric (GE) replaced CEO John Flannery (after just 13 months in the top seat) with former Danaher chief Lawrence Culp, in response to Flannery’s slower-than-expected turnaround efforts. GE has been a lynchpin of the American economic narrative, having pioneered the light bulb and the jet engine. During its vast and distinguished history, it has survived the Great Depression, the dot-com bubble, and the 2008 financial crisis. It was one of the original components of the Dow Jones Industrial Average, and had the longest continuous presence on the index before being removed from the index in June 2018. GE’s shares recently nosedived to fall below the $100 billion market cap threshold, effectively wiping out US$500 billion in value since its peak market cap of ~US$600 billion in August 2000. For such as iconic enterprise, the fall could not have been more dramatic. While much of the market commentary has tried to blame GE’s decline on everything from short-sighted leadership (even under the legendary Jack Welch), expensive (and often inexplicable) M&A deals, and poor cash deployment, the truth is that it has suffered from a not-so-uncommon problem… lack of a future-proof digital operating model. The company has struggled to reorient its portfolio in time, something for which Welch, Immelt, and Flannery were criticized. It has witnessed sluggish growth, despite divesting what it perceives are “non-core” businesses. Over the years, it overpaid for assets in “legacy” businesses – a typical sign of hubris – e.g., its US$9.5 billion acquisition of Alstom, which represented a doubling down on fossil fuels. A combination of these short-sighted decisions has led to sluggish growth in emerging areas, such as healthcare. Its healthcare unit is now looking to spin out into a separate and independent company by 2019, despite being an important profit center with US$3.4 billion, or 18 percent in profit, in 2017. Essentially, it accounted for 16 percent of GE’s sales, but ~50 percent of its operating profit in 2017, which is a prime example of the misplaced bets GE has made over the years. This not to say that GE has failed invest in upping its digital game. It has positioned itself as an industrial leader of the digital revolution, with major bets in software players and the Predix industrial IoT platform. Digital is still a US$4 billion business for GE, but its aspirations seem dramatically cut short. Former CEO Jeff Immelt established the GE Digital business in 2015 as a part of a grand vision to transform the conglomerate into a “digital industrial” company. And yes, invested US$4 billion into the unit. After Immelt’s resignation last year, Flannery has scaled back these ambitions to focus on what it considered the “core” businesses. As of July 2018, GE was reportedly looking to hive off its digital assets, including Predix. Not really. Our recent research on the evolving digital services market reveals that three in four enterprises have failed to realize sustained returns on their digital investments. Leading enterprise executives singled out the operating model – or lack thereof – as the most important crucial determinant of success in this journey. Amongst various issues, 69 percent of enterprises consider organization structure a barrier while scaling up their digital initiatives. Enterprises that do not meaningfully reimagine their operating models cannot sustain digital transformation initiatives. Most organizations take a half measure by just focusing on digital strategy. If the enterprise operating model is not aligned with the digital strategy and business model, the desired returns from a transformation initiative cannot be achieved. Governance: Portfolio-based technology investments with aggregate business benefits such as ROI. Experience-centricity: Moving beyond customer-centricity to focus on the experience of the ecosystem. Enterprises need to stop looking at digital transformation as an end-goal in and of itself. Rather, it’s a means to an end. When undertaken for short-term incentives and playing buzz word bingo, digital initiatives are more often than not doomed for suboptimal returns if not outright failure. Enterprises need to define the objective functions, and work backwards to establish a resilient and nimble operating model in order to stay relevant and thrive. In news that has caused a huge stir in the technology world, Broadcom, the semiconductor supplier, reached a definitive agreement to acquire CA Technologies, a leading infrastructure management company, for a whopping US$18.9 billion. Many view the deal through a dubious, even critical, lens that points to Broadcom’s loss of strategic focus through a broadening of its capabilities beyond the semiconductors space. While the paucity of business synergies may seem true given the discrete nature of the two companies, the deal is not surprising when you examine the fragmented nature of the infrastructure software market. Coping with bewildering choices in the realm of IT infrastructure management has been an impediment for most enterprises, leaving IT personnel grappling with a myriad of software and tools. Having said that, the advent of the converged stack approach is seen as the vanguard that can bear the mantle that democratizes infrastructure management. As time unravels the mysteries behind this move, the acquisition of an infrastructure software company may prove to be Broadcom’s crown jewel. Broadcom has long embraced inorganic growth. 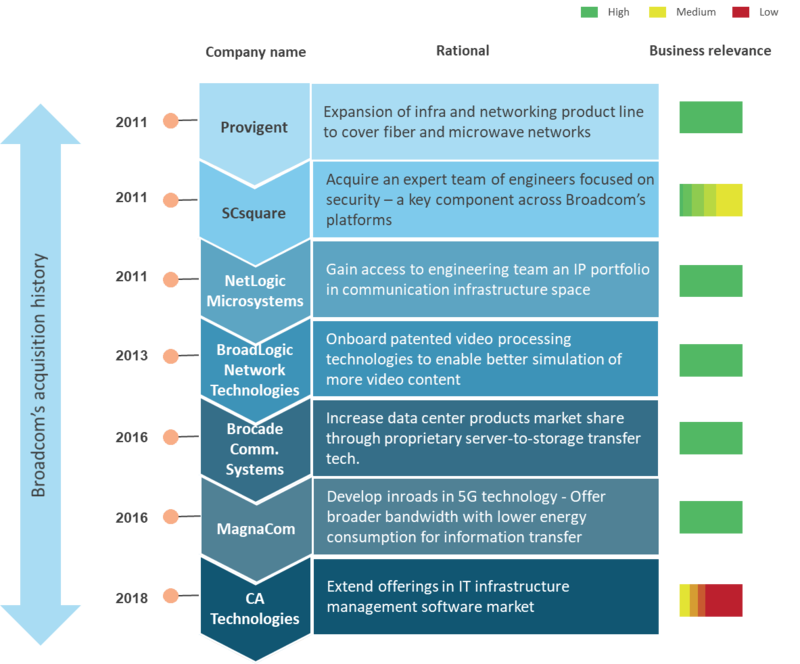 While its past acquisitions have centered around expanding its portfolio in the semiconductor business, CA will likely give it considerable headway in becoming a leading infrastructure technology company. Broadcom’s revenue has been bolstered by its strategy of buying smaller businesses, and incorporating their best performing business units into the company. With this acquisition – expected to close by Q4 2018 – Broadcom is looking at ~25 percent business revenue from enterprise software solutions. Broadcom will also gain access to CA’s 1,500+ existing patents on various topics including service authentication, root cause analysis, anomaly detection, IoT, cloud computing, and intelligent human-computer interfaces, as well as 950 pending patents. 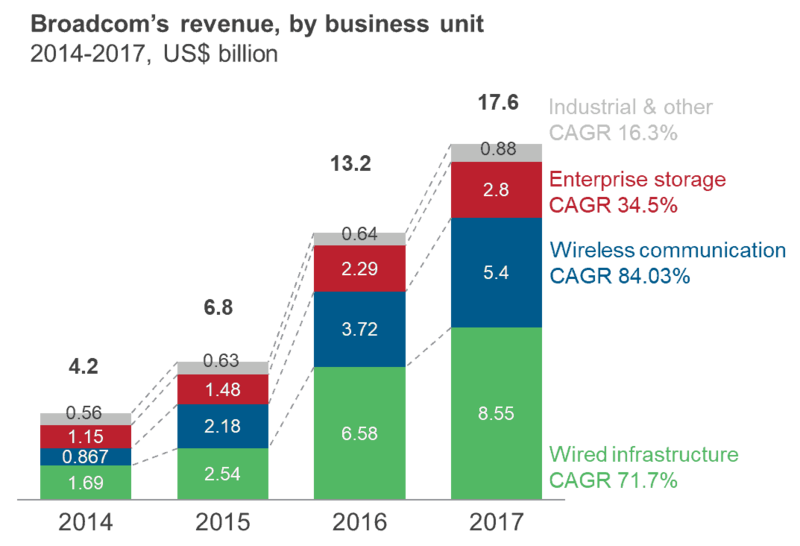 When you examine Broadcom’s business mix shift, you see an acquisition-driven approach aligned to its Wired Infrastructure and Wireless Communication business segments. These are the segments where CA brings in more downstream muscle to create an end-to-end offering for the infrastructure stack. Thus, Broadcom’s apparent strategic tenet to establish a “mission critical technology business” seems to be satisfied. However, not everyone is convinced. The market was caught off guard, and is worried that this might be a reaction to Broadcom’s failed bid for Qualcomm earlier this year. Its stock has fallen by 15 percent since June 11, and the street is betting that it will plummet by another 12 percent by the middle of August 2018. It’s Not Just about Broadcom, Is It? With software as the strategic cornerstone, CA Technologies has scaled its offerings in systems management, anti-virus, security, identity management, applications performance monitoring, and DevOps automation. With enterprises shifting gears in their cloud adoption journey, revenue from CA Technologies’ leading business segment – Mainframe Solutions – has been declining for the last couple of years. But this decrease has been offset with rising revenues from its Enterprise Solutions. Moreover, before the acquisition announcement, CA Technologies had been trying to shift its model from perpetual licenses to SaaS and cloud models. As Broadcom moves ahead with onboarding CA Technologies’ offerings, it will gain access to downstream revenue opportunities as it will be able to provide customers a broader solutions portfolio. The size and opaque intent of this deal have evoked myriad market reactions. With Broadcom taking an assertive stance to expand into the fragmented infrastructure software market, increase its total addressable market, and capitalize on a recurring revenue stream, we wouldn’t be surprised to see it forging partnerships to propel the software solutions business it acquired from CA. Additionally, this deal will probably not face the same regulatory hurdles that ended up derailing Broadcom’s US$117 billion takeover bid for Qualcomm. As Broadcom broadens its portfolio from beyond its core semiconductors business, it is laying down a marker and taking meaningful steps to build an enterprise infrastructure technology business. This aligns well with the collapsing enterprise infrastructure stack. But the question is – will CA’s largely legacy dominance be enough to propel this turnover in the digital transformation era? While uncertainty about business synergies looms over this proposed acquisition, it will be interesting to monitor how Broadcom nurtures and aligns CA’s enterprise software business in its broader go-to-market strategy. Several of us from Everest Group attended Atos’ Global Analyst Conference in Boston last week (April 5-6, 2018). That this is the third consecutive year the €12.7 billion IT services company has held this event in the U.S., even though it’s headquartered in France, makes it abundantly clear how important the North American market is to its growth strategy. The conference featured an interesting line up of North America leaders, global practice heads, customers, and partners. Here are some of the highlights. 2017 was a year of sizable growth for Atos. It clocked revenue of €12.7 billion, growing at 10.1 percent (at constant FX), with organic growth at 2.3 percent. Its operating margin stood at 10 percent, and its book to bill was at 110 percent. While organic growth is within its guidance, the company plans to leverage its debt-free portfolio to continue its M&A posture. Since 2011, the partnership between Atos and Siemens has resulted in €2.5 billion in combined order intake. In the week leading up to the conference, the companies announced continued investment in their strategic alliance, with another €100 million of investment across AI, data, and cybersecurity. Atos’ ecosystem positioning was also evident as its partnership with Dell Technologies continues to play out in strategic areas including cybersecurity, hybrid cloud, and analytics and big data. It’s clear Atos is looking to tap the potential of the digital market by striking strategic partnerships to accelerate time-to-value. Within the broad spectrum of technologies that encompass “digital,” IoT is starting to gain significant traction in the modern enterprise. Service providers are moving beyond free pilots as the conversation has turned from experimentation to business value. Atos laid out encouraging progress with actual client successes and measurable outcomes across a range of industries such as CPG, chemical, oil and gas, telecom, etc. In the last couple of years, cybersecurity has become a CXO imperative due to high-profile data breaches and attacks. In the week prior to the conference, Boeing, Lord & Taylor, Saks Fifth Avenue, and Under Armour joined the burgeoning list of recent victims. Atos underscored the importance of security as a bedrock of its digital factory framework, as well as partnerships with Siemens and Dell Technologies. Coming on the heels of the Facebook-Cambridge Analytica scandal, the conversation around data ownership, access, and consent is finally gaining traction. A number of use cases showcased how Atos is establishing digital trust by laying down guardrails on who owns and can access data as their clients embark on digital transformation. Atos fellow Nicolas Kozakiewicz led an interesting discussion about how Atos (specifically Worldline) and Bureau Veritas have partnered on a real-world blockchain engagement named “Origin” to improve traceability of food products. This is one example of the fact that enterprises and service providers are starting to look beyond the initial hype to understand specific problems that lend themselves to a blockchain-based solution. Of course, questions around curation, trust, and scalability remain. And we’ll say it loud and clear here: despite what the market may have you believe, blockchain is not the holy grail solution for every business problem. In the last few years, Atos has acquired companies in the security, cloud, and data functional areas, in the North American region, and in the healthcare vertical. Healthcare and life sciences is now a €1 billion+ business for the firm, building on its acquisitions of Xerox’s NA ITO portfolio, Anthelio, Conduent’s provider businesses, and Pursuit Healthcare Advisors. It is now tying these investments into a coherent and differentiated value proposition for the segment. The market is realizing that while digital technologies and operating models impact clients, they can also be used to unlock internal service provider value. In a panel with customer Johnson & Johnson focused on the Future of Work, Atos highlighted how it is using digital internally to improve the employee experience through an interesting chat bot / agent to map and serve personalized employee journeys, dubbed Chief Happiness Officer or CHO. Atos is at an interesting junction as it builds on its core technology strengths around high-performance computing, data analytics, cybersecurity, and IoT, as well its investments to become more meaningful in North America. 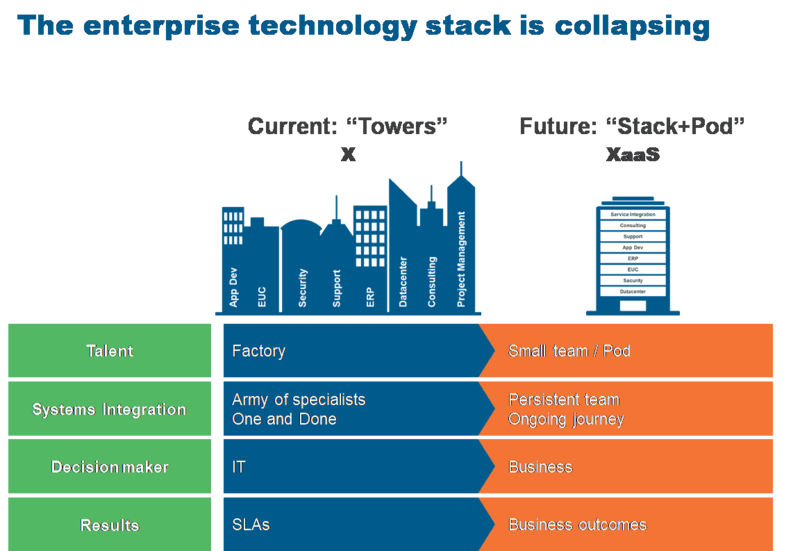 We’re seeing two distinct “markets” within Atos’ digital services world – IT modernization and business transformation. Conflating the two is suboptimal, as they are driven by different stakeholders with different imperatives, buying behaviors, and needs. While Atos is building on its technology-led story, it will be interesting to see how it builds out its business transformation narrative. In a major statement that reaffirms its vision of becoming the backbone of the modern digital enterprise, Salesforce acquired MuleSoft, a leading application network platform, for a hefty US$6.5 billion. This is the software giant’s largest ever acquisition. It is evident that MuleSoft will complement Salesforce’s PaaS agenda, per Salesforce’s statement that it will leverage MuleSoft to create the “Salesforce Integration Cloud.” MuleSoft’s AnyPoint Platform, which connects different cloud applications via APIs, is a good fit with Salesforce’s platform offerings. Gain a stronger competitive foothold: Salesforce has been competing with Oracle and Microsoft in the CRM space. With players such as ServiceNow and Workday pivoting towards platform services, this deal enhances Salesforce’s platform play. Salesforce CEO Marc Benioff has been chasing hyper-growth, with ambitions to nearly double the company’s current revenue to US$20 billion by 2022. While Salesforce’s growth has been relatively muted growth recently (~25%), he application network platform business grew by an impressive 37 percent YoY in Salesforce’s Q418. This presents a strong opportunity for Salesforce to enhance its PaaS portfolio, beyond the headway it’s been making in infusing AI and IoT capabilities across its platform to deliver a more personalized experience for customers. Naturally, the next smart move for Salesforce would be building or acquiring a strong API integration engine that helps it access and connect data across enterprises, regardless of its location. Evaluating its acquisition chronology, it was time for Salesforce to start owning the integration experience as well, while also trying to stitch together an integration cloud and potential iPaaS offering. The acquisition of MuleSoft gives it just that, with the added advantage of ensuring a faster time to market and a broader customer base. Additionally, MuleSoft was growing at a fast clip, clocking revenue of US$297 million for FY2017, 58% YoY growth, with guidance of US$405-415 for FY2018 (with an aim to reach US1 billion in revenue by 2021). The growth story notwithstanding, Salesforce is paying a premium for MuleSoft, with an enterprise value to sales multiple over 20x, which is a reasonably high compared to typical deals in the segment. Salesforce is not alone to tap into the API ecosystem. Google acquired Apigee in 2016 for US$625 million, while Red Hat acquired 3Scale in 2016. This interest in tapping into the API and integration economy is not accidental. Enterprises have realized that they cannot move the needle meaningfully when it comes to digital transformation if they don’t get their technology estate in order. As we’ve opined before, creating the next breakthroughs in digital requires collapsing the stack to eliminate friction across the value chain. Digital needs to be enabled through convergence of emerging technology themes to drive efficiencies across back-office and core mid-office business processes and enhance competitive advantage by impacting market-facing front-office processes. To do this, it is not enough to invest in a solitary mobile app for customers or an internal gamification initiative, it requires efficient plumbing (e.g. DW/BI, creating data lakes, etc.) as a precursor to meaningful digital transformation. Our recent enterprise research also indicates that front office digitalization or Digital for Growth (DfG) is just the tip of the proverbial iceberg (less than a fourth of the spend), while a significant share is focused on the nuts and bolts (Digital for Efficiency / DfE and Digital enablement). The size and intent of the deal has certainly piqued the market’s interest. With the aggressive stance Salesforce is taking to expand its PaaS portfolio while playing the customer experience card, it wouldn’t be surprising if we see it forging more acquisitions and/or partnerships, including other companies in the API economy. Enterprises will need to keenly evaluate this landscape to choose the right partner in their digital transformation journey. What is your take on the Salesforce-MuleSoft deal? We would love to hear from you at [email protected] and [email protected]. If I had a penny for every time Artificial Intelligence was mentioned during the recent NASSCOM India Leadership Forum, I could buy a lot of Bitcoins. Both hype and hope abound around AI and its impact on different industries’ business models. Let’s take a look at AI the healthcare industry. Adoption is increasing, helping solve a number of problems for patients, doctors, and the industry overall. AI engines are helping doctors identify patterns in patient symptoms with data and analytics, improve diagnoses, pick the right treatments, and monitor care. For instance, physicians can now plug diagnoses into IBM’s Watson for Oncology and receive treatment suggestions based on historical patient data and information from medical journals. Face2Gene combines facial recognition software with machine learning to identify facial dysmorphic features, helping clinicians diagnose rare genetic diseases. Mental health treatment: Can AI be the cure? Using AI to treat mental health issues is particularly fascinating. So far, AI has only been viewed as a means to help healthcare professionals provide better care. But can it eliminate a patient’s need to consult with a doctor altogether for mental health-focused moral counseling and empathetic support? Consider this: AI engines today have the ability to listen, interpret, learn, plan, and problem solve. Early identification of mental health issues is possible through the analysis of a person’s facial features, writing patterns, tone of voice, word choice, and phrase length. These are all decisive cues in learning what’s going on in a person’s mind, and can be used to predict or detect and monitor mental conditions such as psychosis, schizophrenia, mania, and depression. Thus, it’s not surprising that a few players have already begun to delve into this space. Woebot is a software chatbot that delivers a mood management program based on Cognitive Behavior Therapy (CBT). AI luminary Andrew Ng is on the company’s board of directors. Randomized controlled trials at Stanford University have shown that Woebot can help reduce symptoms of depression and anxiety in two weeks. Another example is Tess, a psychological AI that communicates via text, administers highly personalized psychotherapy, psycho-education, and delivers on-demand health-related reminders, when and where a mental health professional isn’t available. It can hold conversations with the patient through a variety of existing technology-based communications, including SMS, WhatsApp, and web browsers. More recently, Facebook started using AI to help predict when users may be suicidal. Are robo-doctors just around the corner? Could training AI systems with biased data lead to them make biased decisions? Will users even take advice from software as seriously as they would from a qualified professional? Can the technology successfully cater to a universal population? The ecosystem is trying to solve for these and other questions. While it might be too early to say that AI-based mental health treatment options can become mainstream currency, they clearly create significant value. As healthcare organizations and patients experiment with these use cases, there’s a sizable opportunity to reimagine the workflow and treatment paradigm. In August 2016, Everest Group published an analysis of hot digital health startups that were disrupting the status quo of the industry landscape. It ended becoming a unicorn-spotting analysis…cut to February 2018, and by healthcare and life sciences organizations have acquired three — Flatiron Health, NantHealth, Practice Fusion — and among the top 25 players. While we speak, there are multiple conversations around the others as investor interest peaks. What are the key business reasons behind these three acquisitions? Flatiron Health by Roche: Flatiron Health has an end-to-end cloud-based EHR platform (OncoEMR) exclusive for oncology that curates the evidence-based drug development process. As oncology is one of Roche’s major focus areas, this is extremely valuable for the company while devising cancer drugs. No wonder Roche agreed to a US$1.9 billion acquisition price, in addition to its existing stake in the company. Flatiron Health also has a OncoAnalytics module that leverages big data analytics for better diagnosis and treatment. NantHealth by Allscripts: NantHealth is a cloud-based healthcare firm that aims to improve patient outcomes and personalized treatment. Its proprietary learning system, CLINICS, utilizes machine learning and cognitive computing to provide information for better care delivery, tools and insights for efficient care financing, and wellness management programs for enhanced patient engagement. NantHealth fits well within Allscripts’ ambitious plan to build a healthcare company that drives innovation in patient care and improves evidence-based research in R&D processes. Practice Fusion by Allscripts: Practice Fusion is a web-based cloud EHR platform that also provides patient engagement and practice management assistance. Unlike traditional EHR platforms, Practice Fusion provides a simple and intuitive user interface. Beyond these capabilities, this acquisition also adds ~30,000 ambulatory sites to Allscripts’ client base in the hard-to-crack independent physician practices segment. Data is the new oil: The real asset is access to critical healthcare data. Companies that convert the data into actionable insights, resulting in better patient care, emerge as clear winners. Uberization of everything: Healthcare enterprises have struggled with huge fixed investments in EHR platforms, on-premise infrastructure, etc. This has created a deep dent in their profitability numbers. Because Flatiron Health, NantHealth, and PracticeFusion and are cloud-based companies, there are no more fixed costs, everything is demand-based. Clearly, the as-a-service model has become the choice for healthcare firms. Care – of, by, and for the people: Accelerated R&D cycles, augmented physician capabilities, and improved precision in diagnosis and treatment all ultimately result in improved patient care, enhanced clinical outcomes, and boosted patient engagement. All three of these acquired companies focus on improving at least one of those factors. And they all allow the acquiring companies’ patients to take center stage. At a broader industry level, these acquisitions mirror the change in sentiment around digital initiatives. Our research shows signs that enterprises are moving beyond proof of concept to proof of value. While digital, as a market, lends itself to smaller deals with focuses on design thinking, first principles problem solving, and business model redesign, we see these initiatives now scaling up. As the digital marketplace matures, investment activity is only going to intensify. While early adopters are reaping rich rewards, valuations and competition for viable targets are likely to skyrocket. It’s clear that healthcare enterprises see significant business value, and are willing to put their money where their mouth is. Stay tuned to this space for more analysis of what’s happening in the healthcare and digital spaces.